Victoria Sampler Bumblebee Lace design. My favorite stitches within this design are the diagonal ones (pulled straight crosses) and the corner blanket flowers both of which I worked in the light blue size 12 perle cotton. Threads, yarns, beads, and ribbons were from my stash, they do not match the material suggested within the Victoria Sampler pamphlet. 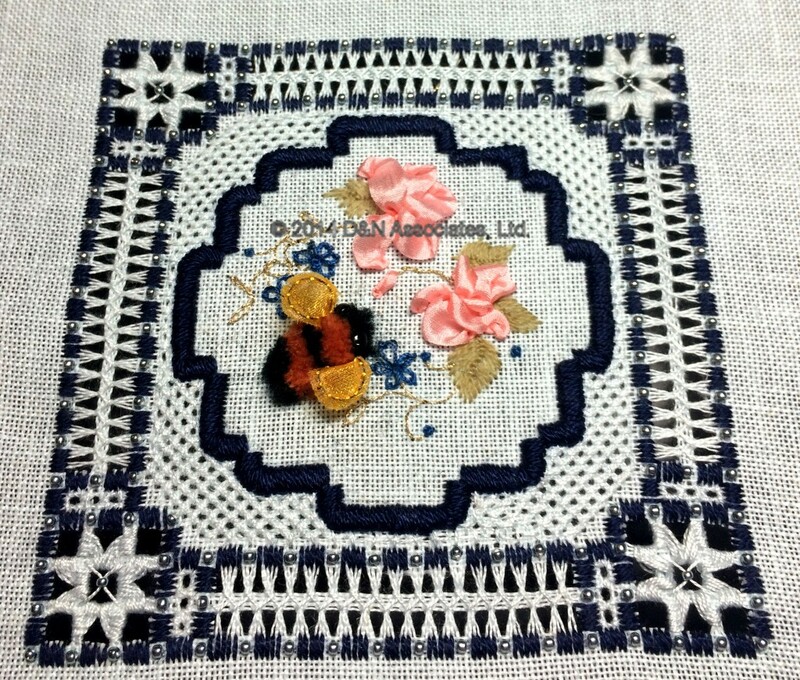 This instructions for the Bumblebee Lace stitch sampler suggested to work this design on a linen flaxen 32 count (about a 4.5 inch square worked design) using white or cream size 8 and size 12 perle. I used a 28 count light Blue Lugana fabric which produced a five inch square worked design. The two DMC perle I used were a dark blue size 8 and a light blue size 12 (that matches the fabric). 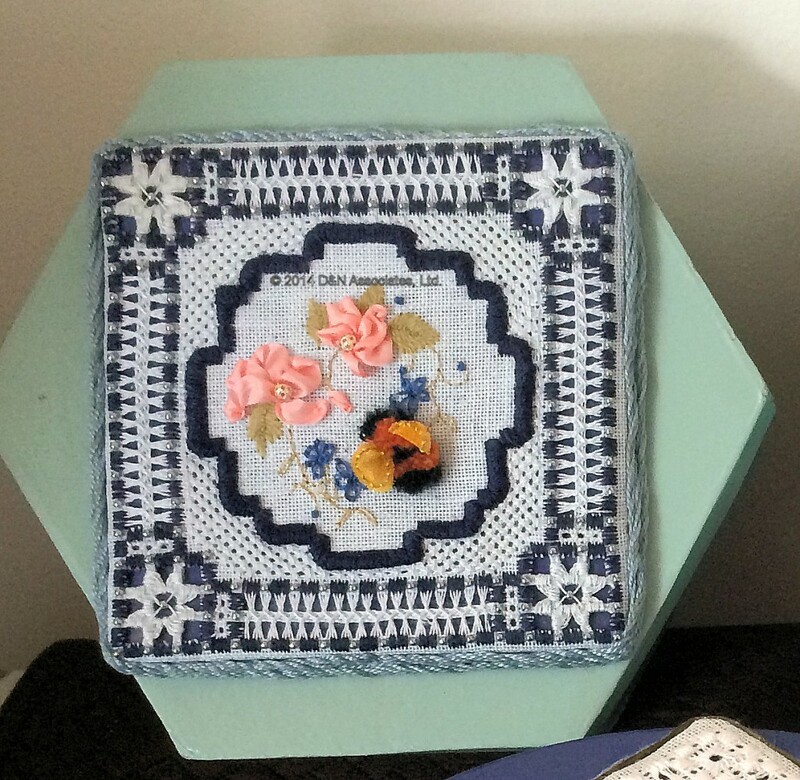 September 2014 I signed up for a Victoria Sampler three weeks cyberclass for this design. The instructions for the class were thoughtfully written and greatly enhanced my learning the stitches presented in this sampler. 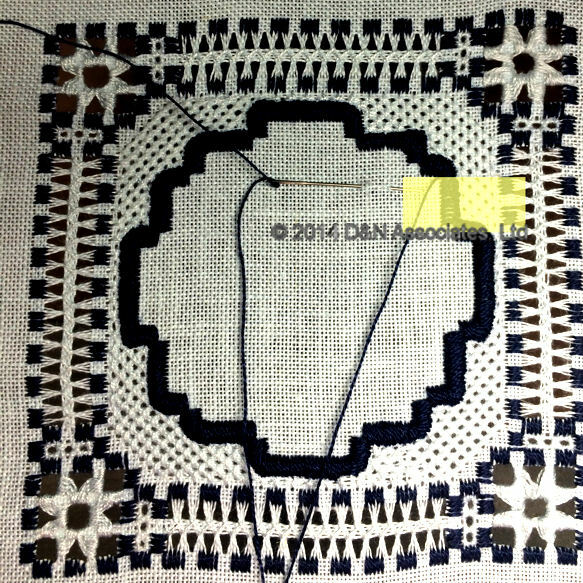 Stitches worked in the dark and light blue perle are: Kloster Blocks, Hemstitching, Blanket Stitch Flower, Woven Bars (under the branches of the blanket stitch flowers), Algerian Eyelets, Pulled Straight Crosses and Buttonhole Stitches. Week three covered working the inner most area of this design using Fly Stitches, Colonial Knots, Lazy Daisy Stitches, Japanese Ribbon Work and Beadwork. 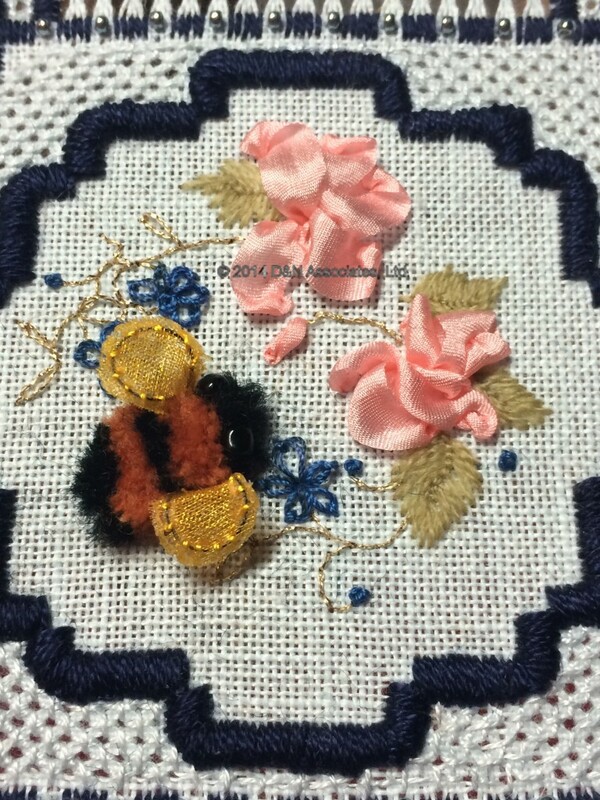 Plus the stumpwork Bumblebee. 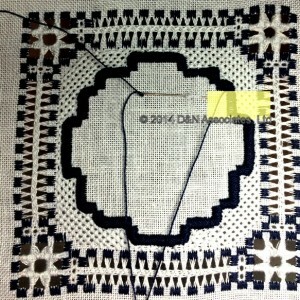 I did the buttonhole stitches (inner stitching of the dark blue) before I did the cut work. As I worked the corner blanket flowers and the four long lengths of hem stitching I kept looking at my buttonhole stitching … disliking it more and more as my tension was uneven and there was often fabric showing through. I decided to cover the buttonhole work with satin stitching (in the same dark blue). I took the photo below just as I near finishing the satin coverup stitching, did the light yellow highlight on the image so I could remind myself in the future that my buttonhole stitching needs a bit more practice. 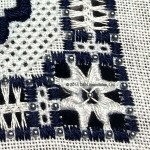 This photo shows one of the corners after I added the beads. 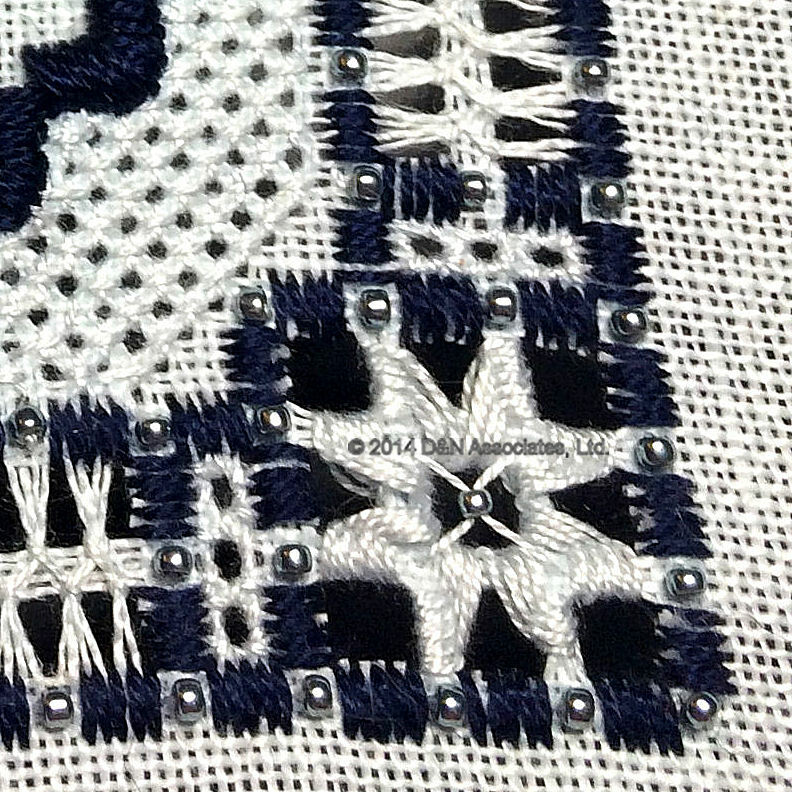 This left and top edge of this photo shows the two line of hemstitching between the two rows of kloster blocks (dark blue stitching). Corner is the blanket flower stitch. Below photo shows the finished worked center area of the piece. Bumblebee is turkey stitch using wool yarn. For the center silk ribbon flowers I used YLI 7mm color #111, the blue flowers were stitched in 12 wt. Sulky Petites Blendables – Royal Navy. The gold vine is stitched in Kreinik #4 very fine braid, color 002. Below photo shows finished piece adhered to lid of a 7-inch paper mache 7 x 7 x 3 inch deep hexagon shaped box. I purchased this unfinished paper mache box from amazon.com then spray painted the box using a soft green gloss paint. The finished stitched piece was adhered to a quarter inch thick mat board with dress maker pins along the raw edge of the mat board. I used the Kreinik Custom Corder and size 5 Perle thread to create the med slate blue braid which I then pinned around the edge of the mat board after which I glued the mat board onto the top of the box lid.